While Litecoin might be a “relic” according to Tushar Jain, their developers are ready to slash transaction costs by a factor of 10 once Litecoin core 0.17 goes live. 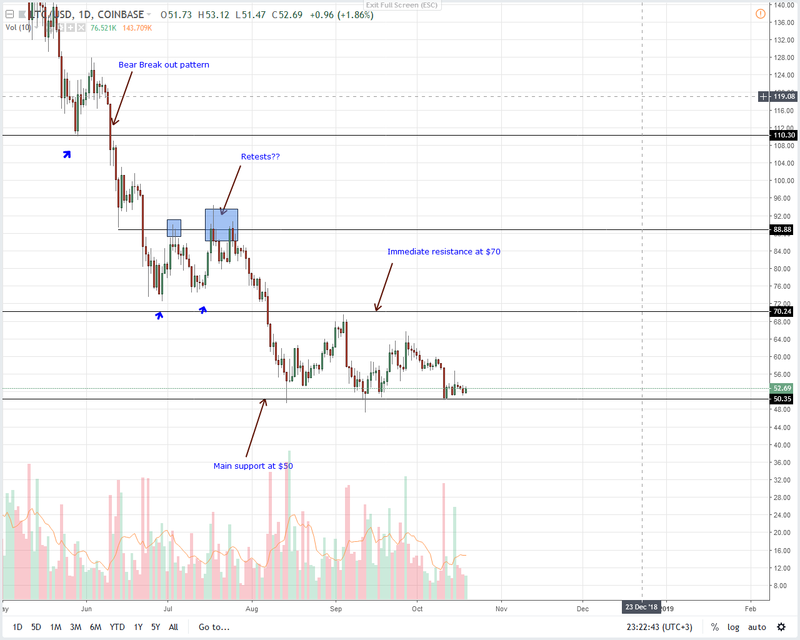 The release date is tentative but what we know for sure is that EOS trade volume are roughly five percent that of Ethereum. Besides, it’s prone to congestion all thanks to the introduction of Block Producers who often collude locking out “outsiders”. According to reports, there is a CPU problem in EOSIO and sources show that it’s not unusual for network users to stake 95 percent of their total EOS between CPU and bandwidth. The reason has been found to be due to general Block Producer operation configurations where the network congests once 20ms of CPU block time is hit. 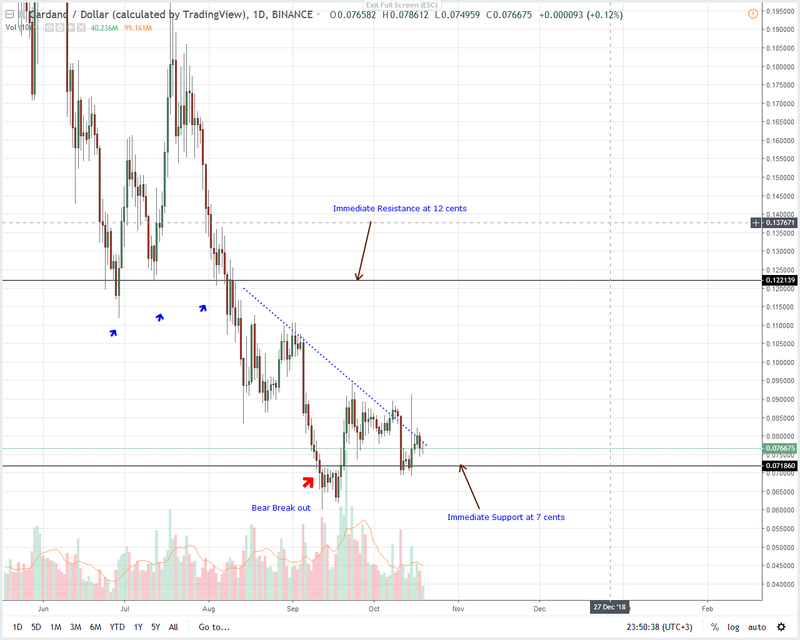 This shift of EOSIO staking algorithm could explain why there is a lot of coin staking going on in EOS where it is not unusual for network users to stake 100 percent of their coin just to use a similar amount for free transactions. While ordinary network users don’t earn interest for their EOS stakes, Block Producers are actively colluding and earning transaction confirmation rewards despite the network’s low transaction volumes and high odds of network congestion. 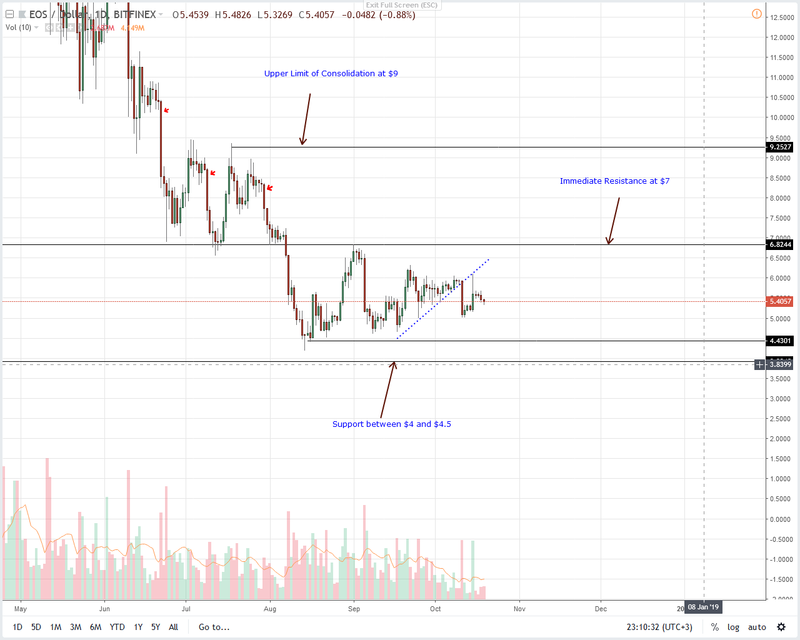 Back to price action and the coin is likely to end the week on a high after printing 4.8 percent. 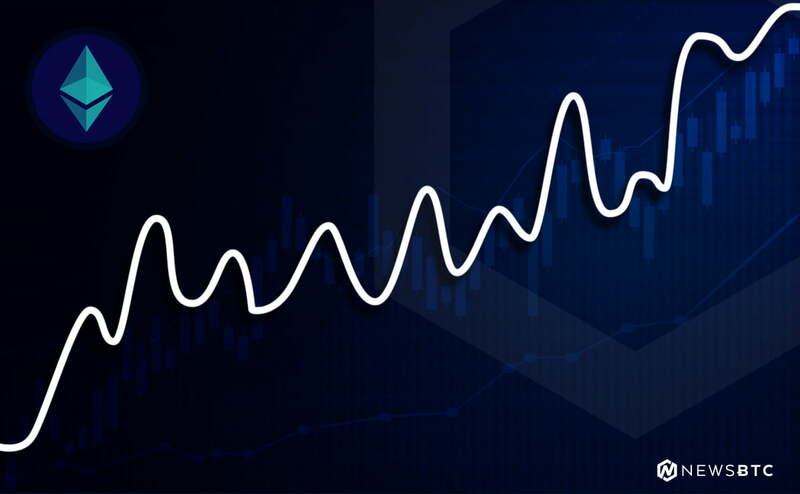 Though prices are stable in the last day, our previous price forecast still hold going forward and still we expect bulls to reign over the weekend. Our reasoning is simple. Notice that sellers did fail to reverse Oct 15 gains. At the same time, these losses were accompanied by light volumes. As such, we remain optimistic but before we suggest trades, buyers must first rally and close above $7. Thereafter, we shall recommend buys on dips with first targets at $9. Network transactions fees are in place to protect the network from spam. Aside from that they create this hierarchy of demand for miners where those who pay higher would most likely get a slot in a block. 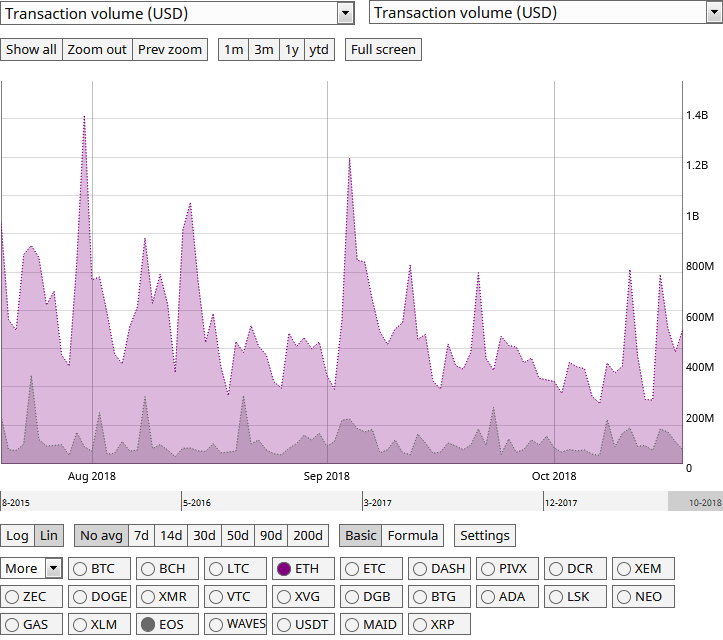 These transaction fees fluctuate but Litecoin is taking the lead trying to suppress costs. In their next release–Litecoin Core 0.17, developers want to slash these fees by a factor of 10 to $0.005. Price wise and Litecoin is a top performer in the last day. It’s up 1.3 percent according to statistics but bulls are yet to edge above Oct 15 highs. Like before, we retain a neutral but bearish stand aware that gains above $70 would usher in conservative traders eyeing $90 and $110. In the mean time, risk-off, aggressive type of traders stand a chance of profiting if enough momentum build up and bulls close above $60. This is Oct 11 highs and a minor resistance level as far as our analysis is concerned. Rallies above $60 shall trigger aggressive bulls eyeing for $70 and $90, the upper limit of our resistance zone. On a weekly basis, Stellar Lumens is up 17 percent taming bears as a result. However, in the last day, price movements have been tight. In fact, what we have in the daily chart is a doji bar hinting at possible indecision. 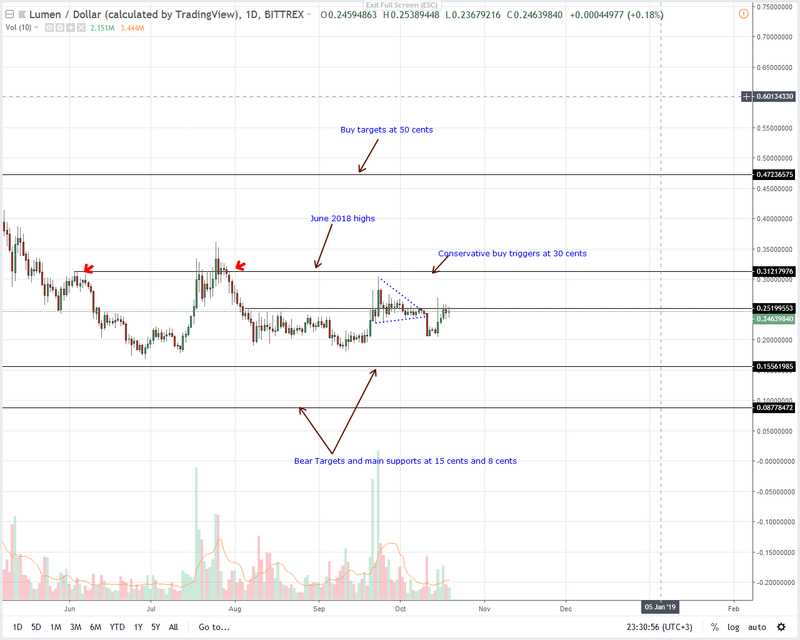 Regardless, our previous XLM trade plan is valid and until we see strong gains above 25 cents, neutral stand shall prevail. But, considering the accumulation of the last three days it’s likely that bulls may close higher today. That’s why we are expectant of Oct 15 follow through before the close of this week. Despite lower lows in the last day, it’s clear that TRX is still bullish. It’s up 15 percent in the last day and encouragingly, prices are still trending inside Oct 15 bull bar. That’s what we retain a bullish outlook expecting buyers to accumulate in lower time frames, build momentum and explode above Sep highs triggering bulls in line with our last Tron price analysis. From our candlestick formation which informs our conclusion, it’s clear that as long as TRX prices are trading above 2 cents, bulls are in charge. Should sellers clear them today then this optimistic projection is null and void. 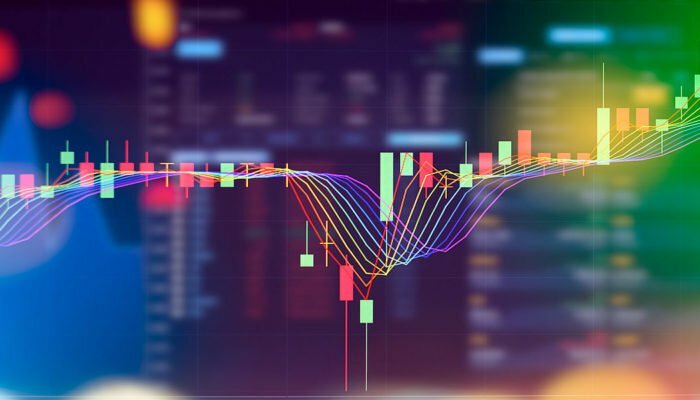 Like Tron, ADA is stable in lower time frames and up eight percent in the last week. Overly, this is positive for buyers. 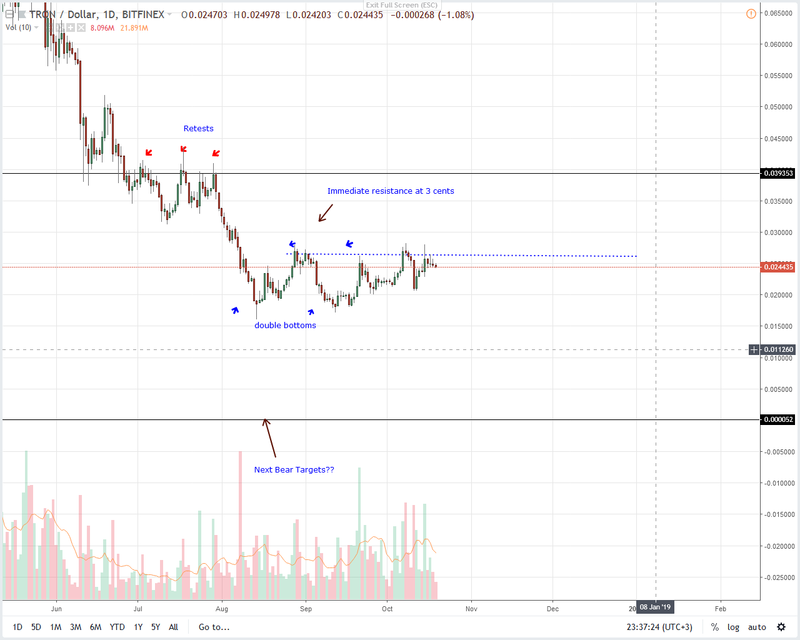 From the chart, Cardano buyers might follow through and cross above the minor resistance trend line and 9.5 cents triggering buys in line with our previous Cardano trade plan. However, before that happens, it’s advisable for traders to take a wait-and-see approach instead of fronting bulls in an openly bearish market.